An exploration of masculinity and male genders roles in Japanese society throughout the years using parts 1-4 of Jojo's Bizarre Adventure. Discussions on gender have often been dominated by a female narrative, not leaving any room to discuss the other side. Men have often been limited in how they are able to express themselves outside of stereotypical masculine behavior in the past, and Japan in particular has historically been very restricted in this regard. This is not to say that different types of sexuality were not widely accepted. Homosexuality in Japan has been recorded since the Heian period, and during the time of the samurai, homosexual relationships were rather common, but often in the context of master and apprentice and with a large age gap. The notable exceptions as far as gender expressions would be the kagema (male prostitutes) and kabuki (male theater actors), who often took on a very feminine appearance and demeanor. This had to do with the kagema often serving male customers and the kabuki often playing female roles. Japanese society is often very rigid and orderly and this was reflected in the people as well. What does JoJo's Bizarre Adventure have to do with all this though? Well, it's a show rather notorious for its male characters and particularly how they express their "masculinity" often in very unconventional and flamboyant ways. JoJo was also created over a long period of time from the 80's, to this very day, and set in various time periods. Although I will only be covering up to Part 4 which was only published until the mid 90's. So what better way to discuss masculinity and gender roles in Japan than to look at how one of the most popular manga and anime franchises deals with them. In the early parts of Japanese history we see a very strong focus on the military and the traditional nuclear family. The first 2 parts of Jojo do not take place in Japan, but in Pt. 1 we see a huge focus on positive traditional masculinity ideals represented by Jonathan and his father, as well as negative traditional masculinity represented by Dio and his father. For the positive side we see things like honor, chivalry, stoicism, bravery and being humble. Dio on the other hand is mischievous, cunning, manipulative and arrogant. Jonathan is very much the boy scout that plays by the rules and does things fairly and justly, while Dio is always playing dirty and trying to cheat the system. These morals and values are very much shown to be passed down from father to son as Dio and Jonathan are not only foils to one another, but a reflection of each of their father's moral values. Fathers were of course seen as the head of the household and highly respected. Although they did not often take part in the domestic labor of the household, they took great care to instill onto their offspring their set of values and beliefs that they would expect their children to also pass down and so on. Part. 2 on the other hand focuses very much on the military aspect of masculinity. The concept of man as a soldier or warrior has existed since the dawn of humanity. Masculinity and war were inexorably linked together. As a man you were expected to go to war and fight for your country, whether you wanted to or not as drafts have historically exclusively targeted able-bodied men. Not only this, but nationalism and fighting and dying for your country was one of a greatest deeds you could accomplish as a man and is still seen an honorable act to this day. During the 2nd Sino-Japanese Wars and WW2, Japan became a fearsome military superpower, conquering large portions of East Asia. Much of this militaristic nationalism can be found in the character of Stroheim, a Major in the Nazi army. Joseph on the other hand is very cocky and somewhat arrogant, being based on various Harrison Ford characters like Han Solo and Indiana Jones (you can see the influence from Indie in his Pt.3 costume). Pt. 2 also brought us the flamboyant Jojo posing based off poses from various fashion magazines and Joseph even cross dressing as we start to stray further from the traditional masculine archetype. We also see the emergence of the absentee father, which will be a recurring theme in Jojo as we move forward. Another recurring theme will be a strong bond with the mother; as Lisa Lisa was integral to Joseph's training. Without a father figure to pass on his morals we do not see the same positive traditional masculine traits being passed down to the newer Jojo's. During times of war fathers are obviously not going to be around to raise their kids, which was the case for Joseph as his father was a British fighter pilot. Pt. 3 deals with a reduction in flamboyancy of the main character, considering Jotaro is very stoic in nature. He is said to be based on Clint Eastwood characters, mostly likely from his early work in westerns. His character design also seems to be heavily based on Kenshiro from Fist of the North Star. Much of the aesthetic for first 3 parts of Jojo is heavily influenced by 80's era Hollywood action movies like Rambo, Predator, Terminator, and even Bruce Lee movies; large bulging muscles and body builder physics. In Pt. 4 the characters seem to lose their gym memberships and have a slimmer and more athletic build, which is more realistic considering the age of the characters. In Japan, the 80's were a time of great economic prosperity which is reflected in the characters of Part. 3 and their confidence and swagger. As far as paternal relationships go, Jotaro's father is a musician that is always on tour. Considering the harsh and demanding work life of Japan it is common that the working man will not have much time to spend with his family. Jotaro's relationship with his mother seems somewhat strained, although he does seem to care a great deal for her considering that she is the driving force of the plot. After the American occupation and as Japan began to feel the effects of the economic bubble in the 80's, we see many many rebellious forms of male expression and the one that is prominent in Pt. 3 and 4 of Jojo is that of the delinquent. Delinquents in Japan are very anti-establishment and more or less the equivalent of American thugs. Sometimes also called yankiis (derived from the term Yankee) they were heavily influenced from American G.I's. This idea of anti-establishmentarianism can be seen in the ever more elaborate ways that the typical military style school uniform is altered in Pt. 4. Okuyasu is the perfect example of a stereotypical mild-mannered and dim-witted Japanese delinquent. Josuke as well embodies many of these delinquent traits. Koichi on the other hand is very different from previous Jojo characters as he is lacking confidence and can even be recognized as an otaku considering his love for Rohan's (a mangaka whom he befriends) manga. 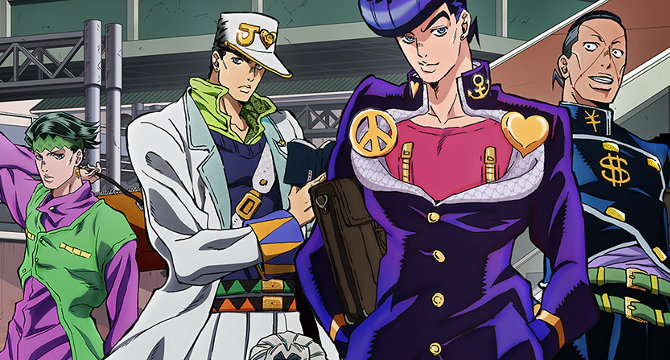 During this time, we see the rise of the working single mother and more boys being raised in single mother households like Josuke. In addition, Kira (the main antagonist of Pt. 4) and Rohan seem to be very non-nonchalant about their lives, happy to just focus on their hobbies and remain single, compared to the typical Japanese salary man who is working ungodly hours and devoting his life to his career for his family. Japan has changed a great deal over the years and this is reflected in the ways in which men express themselves. Japan has a very strict and demanding work ethic, sometimes even leading to karoshi, or death by overwork. It leaves men in particular very little time to spend raising their children and it is often the case that the women in the relationship stays at home and is in charge of financial matters and gives the man a small allowance to spend on himself. As the work ethic that has brought Japan so far ahead economically in the past is becoming too much for the new generation, we are seeing burgeoning social movements like NEETs (Not in education, employment or training), Freeters (people who work various part-time and temporary jobs to make ends meet) and even Hikikomoris (Shut ins/recluses who often live off their parents income). There are even Herbivore men who have no interest in romantic relationships, girlfriends and marriage. Herbivore men also seem to be more preoccupied with their appearance, spending a lot of their money on beauty products. As Japan's economic and social landscape begins to change, more men are seen embracing different types of lifestyles. It is not surprising that many men do not want to be the typical salary man working for a big corporation, and are instead choosing more carefree lives with greater freedom. Much of the time these men are met with shame and ridicule, especially by Westerners who do not have the proper context of the situation. Although there may be larger societal and economic consequences for men who do not fit the traditional mold of what a man should be, every man should have the freedom to express themselves how they want; whether that means playing video games in your mom's basement or spending all your money on anime figurines and body pillows. 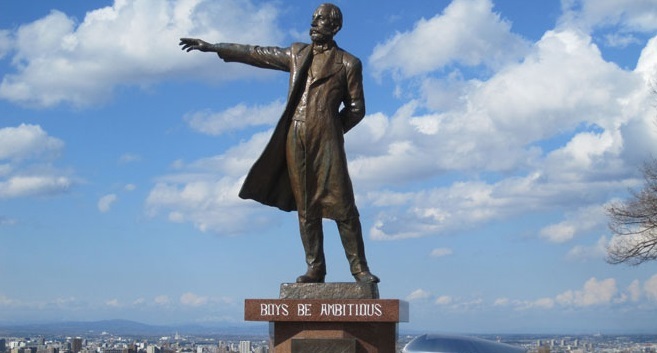 The famous statue of William S. Clark in Sappro, Japan with his parting words to his Japanese students, "Boys be ambitious!" MFA_Community is the official publishing arm of the MAL Featured Articles club. This article was written by LoneWolf, one of the club's writers, in collaboration with the official Featured Articles team. Why Did People Hate the Second Half of Kabaneri of the Iron Fortress? Kabaneri of the Iron Fortress was *the* supremely hyped anime of the spring season, bolstered by its reputation as being the hot new project from the creators of AoT. It was doing great during the first half of its run, but people had given up on the series by its conclusion. What the hell happened? An article exploring the relationship between Berserk; focusing primarily on the Conviction Arc and the philosophical ideas of Friedrich Nietzsche, mostly pertaining to his book "On the Genealogy of Morality" written in 1887. Is Mahou Shoujo Ikusei Keikaku Anywhere Near as Good as Madoka Magica? Magical girl shows aren't usually this dark and gory. Mahou Shoujo Madoka Magica was the first to add some darkness to the usual glittery nature of the genre, and Mahou Shoujo Ikusei Keikaku seems to want to try and recreate that formula for success.